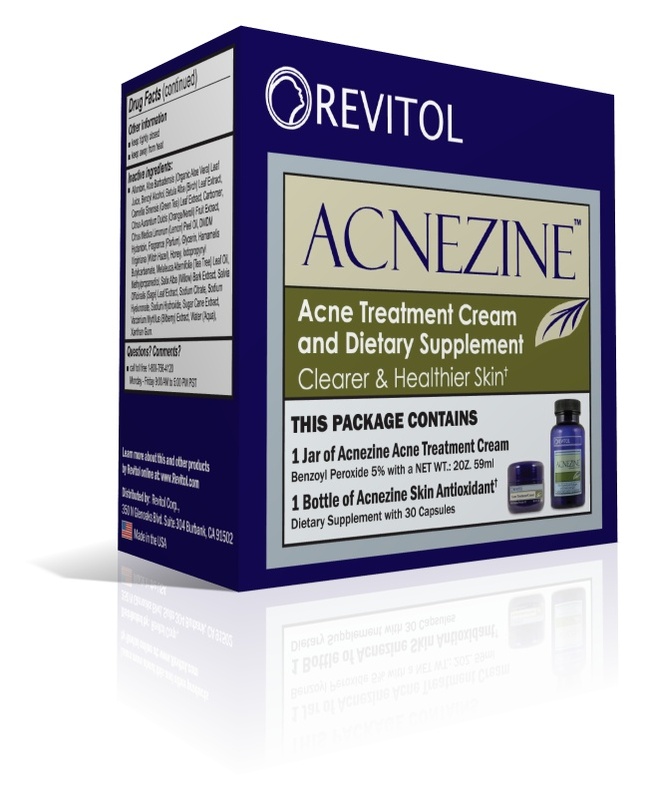 Does Revitol Acnezine Work? An Honest Acnezine Review! Revitol Acnezine became popular due to its television appearances in the US and that’s where we first came across Acnezine cream. The product is advertised as the complete skin care management system which promises to fight acne through a double action treatment consisting of an antioxidant supplement and a moisturizing cream. Let’s find out how it does this and whether it actually helps those suffering from acne. While this product does help people get clearer skin, we recommend Exposed Skin Care. This is a best-selling product that is both cheaper and more effective and has helped many of our readers. For a full review click here. 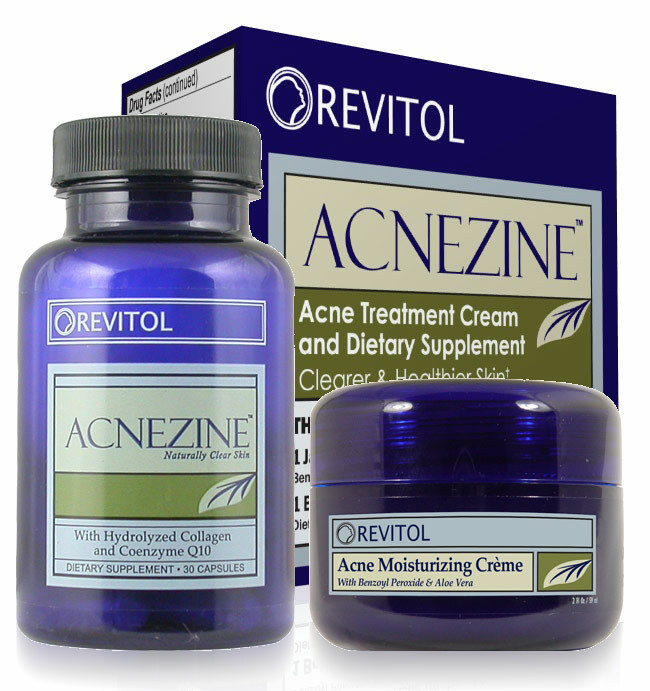 The reason Acnezine works is due to an active ingredient called Benzoyl Peroxide. Benzoyl Peroxide is a well known medication to treat acne and works by decreasing the number of acne-causing bacteria on the skin. This is the main force behind Revitol Acnezine working to reduce outbreaks. In addition to Benzoyl Peroxide, this acne solution has many other inactive ingredients which all work together to form an effective and natural rosacea treatment. Some of the main inactive ingredients in this cream are: Allantoin, Aloe Barbadensis Leaf Juice, Benzyl Alcohol, Hamamelis Virginiana, Honey, Sugar Cane Extract and Camellia Sinensis Leaf Extract. Some of these ingredients have been reviewed in our section covering some of the best home remedies for acne. While many of the popular products on the market to fight pimples treat superficial breakouts, Acnezine is said to really cure acne and heal skin by going deep and therefore preventing future breakouts. While all this sounds great, you do need to take into account some of the drawbacks of using this product. The big problem with benzoyl peroxide is that while it has been shown to be effective at reducing acne, it does dry the skin out. If you have sensitive skin, you will want to monitor how it’s affecting your skin carefully. Acne is horrible, but very dry skin can be worse – so watch out for that! It’s important to properly cleanse the face before applying any type of topical cream such as Acnezine medication. We recommend the best face cleansers here which you might want to use beforehand to maximize the results. After cleansing your face, you want to dry it and apply the cream to all areas of your face that are affected by gently rubbing the cream into the affected areas. There are full instruction on the packaging you should read carefully before using as with any other medication. The problem with this and most other acne medication is the lack of scientific prove which is backed up by pure facts for the product. While we can see no clear indication that the FDA has approved any of the statements made by the company, we did see a little sign saying that it is a FDA registered company. As with anything we review on this website, the best way to figure out whether something works or not is to look at the results other people are getting, and if that’s promising, try it yourself. So does Acnezine work and is it the best acne treatment on the market? It does seem to work very well for many people, and the fact that it’s been sold and has been very popular for quite some time tells it’s own story. In fact, Revitol has been around for some time, being founded in 2002. The important thing to keep in mind is that this product consists of two different treatment and really is a complete solution. These two products work together to achieve much faster results to combat whitehead and blackheads which is great. But the main problem is that the product can be harsh for those with sensitive skin due to the risk of dry skin as a result of benzoyl peroxide, which is contained in the cream. This is more of a problem on the face which tends to be more sensitive as opposed to fighting spots on your body. So to conclude this Acnezine Review; yes this solution does work for many people, which leads us to recommend trying it out. Bear in mind the sensitive skin remark made, but apart from that, the best test is to try it yourself. As with anything else we’ve reviewed on this website; certain products will work brilliantly for one person and not work very well for the next. We have yet to find one magical products that works for everyone, but having read many other reviews on this product we did come away impressed. Let us know whether it worked for you in getting rid of acne if you decide to try it out yourself!